Rebecca White, a close friend of Debbie Rowe, is opening up exclusively to "Extra" about emails she says were written by Rowe to White regarding the custody of Michael Jackson's children, sent just days after Jackson's death. "I know she's seeking custody of the children," Rebecca reveals. "I think she wants the best for the children." 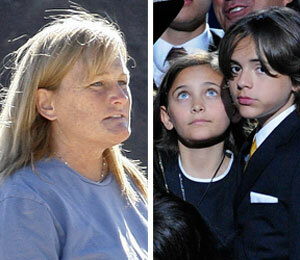 In an email dated July 2, 2009, Rowe's writing suggests that she appears to be conflicted about going after her biological children -- Prince Michael, 12, and Paris, 11. "I'm not going after custody," Debbie writes to Rebecca. "These kids are not mine. They were never mine. They were always Michael's. I was Michael's best friend." Despite that email, Rebecca believes that Rowe is seeking custody. "I think things change on a daily basis," White explains. "It's not like she doesn't love them. It's not like she doesn't want the best for them, but her life is different...The idea of being a mother to those children is something I don't think she really wants. She can't just sit back in the shadows and not say anything because then she will be looked at as the woman who gave up her children and that's a horrible thing to say... She had to do something to protect them in a way." In an email from Debbie to Rebecca on July 5, Rowe seems to be changing her mind about seeking custody. "My lawyer is telling me I have to take some responsibility about the welfare of the children," Rowe writes. "Do I want the kids? Hell no. Does it look good for me to ask for them? Absolutely. I don't want to look like the woman who gave away her kids and just forgot about them. Would Michael want Joe to have them? I think it would be the last thing that he would ever have wanted." White admits that she believes Rowe is motivated to seek custody for financial gain. "The motivation is money," Rebecca says. "I really have to be honest... If the children aren't the ones she wants, what else will she gain from it?" Rebecca also confirms that Rowe told her a secret custody deal is in the works. "Yes, absolutely," White confirms. "In one text message she had just said, 'Just wait until the 14th. Everything will be done after the 14th.'... There's definitely going to be a secret deal. There's definitely going to be a settlement that's going to come out of this."